Morning Light Yoga studio in Uluwatu. Highly recommend. Pro Tip: Do not accept the hotel’s transportation and find your own on the street. When we arrived, we were so sad that it was our last night together. We were finally back in a true villa, the dream all along, at Bali Blue Homestay. We had a huge bedroom, extra random room, and a spacious bathroom, with a cute little terrace looking into the green grass courtyard with a bright turquoise pool in the middle. Heaven, we have arrived. Bali Blue Homestay compound, complete with lush greens and a turquoise pool. Dragonfruit smoothie and chicken sandwich from Sukka. The outdoor patio at Sukka. For dinner, we went to this epic-looking restaurant that had treehouses and whimsical decor called Dedari Theory. However, we quickly realized the place was all show and no substance. Strike one, we were the only ones there. Strike two, they were out of all the entrees I wanted AND Smirnoff Ice, Kevin’s super-masculine beverage of choice in Bali. Strike three, the food was meager, bland, and there was a bug on my plate. Would not recommend. The only thing Dedari Theory is good for is a sweet IG pic. We walked back to the hotel, where I plopped down at the pool to read and relax. Kevin took our new motorbike to cruise the streets. For our evening activity, we hopped back on the bike and rode out to the Uluwatu Temple. We explored and, along with hoards of tourists, enjoyed the local monkeys and the views. 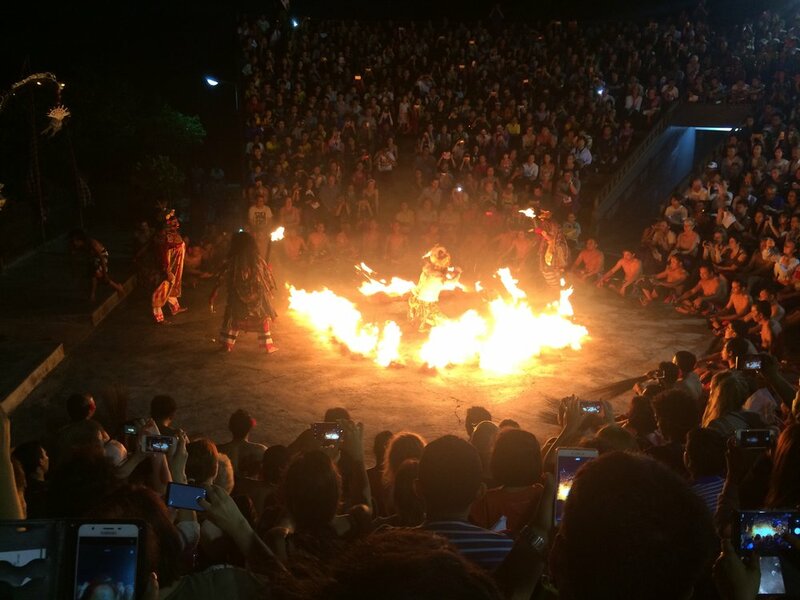 The main event, the Kecak & Fire Dance, which takes place in a cliffside amphitheater inside the park, was spectacular. It features a traditional Balinese storyline, costumes, and the illustrious men’s acapella group, but it's like nothing you’ve seen or heard before. Both getting into the park (30K rupiah) and buying a ticket to the show (100K rupiah) cost money, but the show is worth it all. Sunset view for the Kecak dance in Uluwatu Temple. The Kecak dance in action! You will not regret seeing this show. We drove back from the temple in the dark, which was a new and terrifying experience on a motorbike with windy roads. Our last stop of the day was to be Single Fin, the famous beach bar overlooking the ocean, known for their Sunday night parties. On our way there, we encountered a monkey in a cage, and Kevin, a little tipsy off of Australian wine, sought to find a way to set the sad-looking monkey free. What ensued was an incredibly terrifying altercation with the owner of the monkey, a shop-keeper’s wife who had imported the monkey from Sumatra to be her pet. In no uncertain terms, the woman said she would have her brothers, who apparently owned the line of shops along this dark, deserted street, "teach us a lesson" if we messed with her monkey again. So that was fun. I basically was convinced for the rest of the night that the Balinese mafia would be finding and killing us in our sleep. To make matters worse, Single Fin was closed when we got there! On a Thursday! Bummer for our last night in Bali. Pro Tip: Do not try to free random monkeys from cages, even if they look sad! Kev and I in our traditional garb, required for all to enter the Uluwatu Temple. Incredible cliffside views at Uluwatu Temple. The next morning, we woke up early and Kev gave me a ride to Morning Light Yoga, which was easily one of my favorite experiences in Bali. It takes place in an open air hut within the Uluwatu Surf Villas, with a perfect view of the ocean and mats/blocks provided. At the end, you even get fresh coconut water served to you in its shell! Got to see more baby kittens here, too. The day was a little awkward, because again Kevin and I were on separate flights, and mine wasn’t until 1:30 am that night. We had the day to spend together, but Kevin’s hotel was in Kuta. Since we were getting kicked out of our Uluwatu hotel at noon, we quickly went down to Padang Padang beach and spent an hour on the daybeds for rent. From there, it was off to Kuta again.